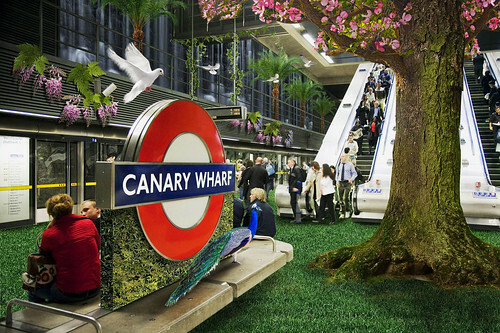 TfL have released a set of digitally transformed pictures which show stations turned into dramatic and tropicial looking urban vistas to launch Underground in Bloom a Tube gardening competition. 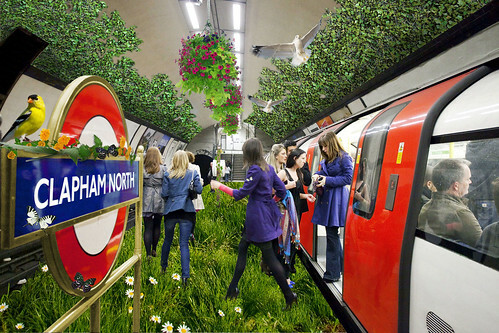 "Underground in Bloom is a competition which recognises London Underground (LU) staff who have added to their station by growing flowers and plants and in some cases even fruit and vegetables within a completely urban landscape. This helps to improve the local environment, encourages flora and fauna and makes travelling more pleasant for passengers." Apparently this year's is the biggest ever competition with almost a quarter of stations, train depots and service control rooms across the system entering. It's not just the suburban stations entering, so look out for a colourful display of flowers at Oxford Circus, Sloane Square, South Kensington and Victoria too. There are eight categories in the competition - Best Newcomer, Cultivated Garden, Hanging Baskets – the John Knight award, Trains and Service Control, Tubs, the Dennis Sanger special award, Best Overall Garden and Gardens in Bloom an art category. London Underground's COO Howard Collins, said: "The Underground in Bloom competition shows that there is a lot more to London Underground than tracks, trains and tunnels. "The work of staff, beyond the call of duty, helps to create a more colourful and pleasant station environment, which can benefit passengers while protecting and maintaining the variety of wildlife and plants on the Tube for the benefit of London as a whole."